The Mahajana Party (People’s Party) was founded in 1984 by Vijaya Kumaratunga. It was led by him until his assassination in 1988. The emergence of Vijaya as a leader of the down-trodden, shook the political arena. The underprivileged masses looked towards him as a saviour. For them, he was a man devoid of cast or creed. He went among the Tamil youth talking to various sections of the Tamil liberation movement. JR made use of his popularity among the suppressed and oppressed people, to call an all party conference to discuss a way out for the Tamil national problem. That was in 1986. The Nava Sama Samaja Party from the beginning was associated with the campaigns in which Vijaya participated. Proletarian campaigns for a just wage and right to form unions, fishers’ campaign for subsidy to their boats and equipment, peasants’ campaign for a better price for their product; all were covered by his giant activities. This mass uprising of ordinary people led by proletarians was a problem for the petit bourgeoisie JVP. 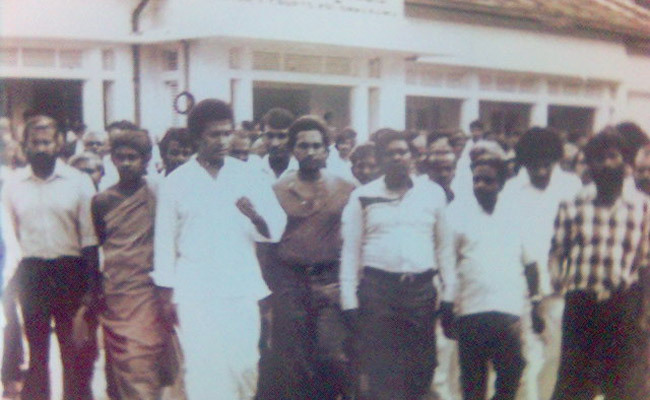 In 1986, Vijaya Kumaratunga visited Jaffna which was under LTTE control. A rare video shows that he visited Nallur Murugan Temple and met local Tamil civilians. He met several youth LTTE leaders before returning to the Lankan military camp. In particular, the contribution of Vijaya in the discussions for devolution of power as a way out for the Tamil national problem annoyed JVP leaders. On the other hand, in 1988, his party came to conciliation with several other left wing parties including LSSP, NSSP, Sri Lanka Communist Party and EPRLF to form a new alliance - United Socialist Alliance (USA). A few days prior to the establishment of the new alliance, Vijaya was assassinated. The agreement for the USA was signed by the party leaders at his funeral ceremony. The USA won a large number of seats in the newly erected provincial councils in an election that was boycotted by the main opposition SLFP. Later the USA forwarded Ossie Abeygoonasekera as its presidential candidate and he would record the last place at the 1988 Presidential Elections but with a substantial vote for a new leader. He obtained 235,719 (4.63%) votes through the election and was placed third. The USA contested the 1989 Parliamentary Elections and won three seats including one from the national list. However, all winners represented member parties of the USA other than the SLFP. One was taken by the Nava Sama Samaja Party. Vijaya was shot in the head with a Type 56 assault rifle outside his residence in the outskirts of Colombo on February 16, 1988 at 12.20 p.m. By Lionel Rajasinghe alias Gamini, who later confessed to the murder upon being questioned by the Criminal Investigation Department (CID). Rajasinghe, in a 141-page statement, confessed that he was merely carrying out orders given to him by the Deshapremi Janatha Viyaparaya (DJV)/Patriotic People's Movement, the military arm of the Janatha Vimukthi Peramuna (People's Liberation Front), an organization which is responsible for assassinations during the late 1980s. 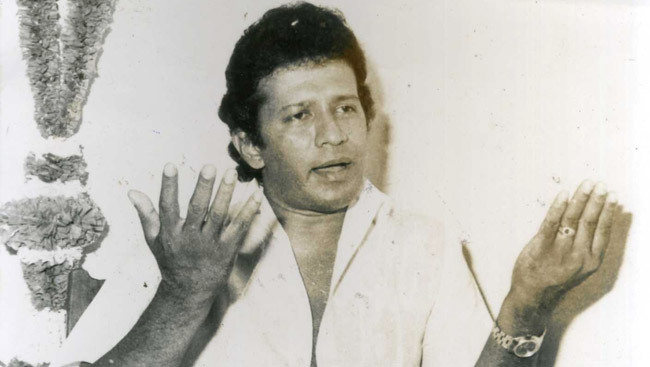 However, the Presidential Commission report had concluded that President Premadasa, Gamini Lokuge and Deputy Minister of Defence Ranjan Wijeratne of the United National Party had been behind the Vijaya Kumaratunga assassination! It is strange how that conclusion came when all others assassinated from the USA were carried out by racists who condemned devolution. The funeral was held at the Independence Square in Colombo on February 21, 1988 as a State Funeral though he represented the opposition against the existed UNP government that proposed autonomy as a solution. It was the devolution issue which brought the USA close to the regime of JR. In the next period dominated by Mahinda Chinthanaya, the United Socialist Alliance collapsed. The Left went in different directions but today, they have come together as an alliance of Unions for Justice and Left parties. In the recent past, they shared a common history as a left movement that supported the democratic revolution that started with the presidential elections. A majority of the Lanka Sama Samaja Party (LSSP), a majority of the Communist Party of Sri Lanka (CPSL), trade unions for justice and the NSSP have come together to celebrate a common May Day at Nugegoda Samarakoon Park. This could be a new beginning for the Sama Samaja movement.